Memories of a Barber-Surgeon A fascinating novel inspired in the life of a great Veronese doctor who lived in the beginning of the 18th century,Girolamo Fracastoro (1478 7553), and illustrated by his observations about syphilis. His best-known work is "Syphilidis sive de Morbo Gallico" (Syphilis or the French Disease). The story, which intertwines itself with fiction, is told by his assistant and confident, a modest barber-surgeon named Gioacchino de la Rosa, a reference to the novelist's patronym. If the character of Gioacchino is an invention by Heitor Rosa, Fracastoro did really exist. He lived mainly in Venetia (Venice, Verona, Padua) and was a field doctor, a university lecturer and even a counselor in the Vatican.The approach adopted by Heitor Rosa is very subtle in that it makes us revive, yet in an unconfessed fashion, the contemporary drama of AIDS, marked by social and religious prejudice, by racist hypotheses, popular beliefs, dissolution of customs and above all by millions of deaths worldwide.Rosa's literary style is the very image of the character of the barber-surgeon simple, unburdened by language artifices, minute and straight-forward.Permeated by historical, geographical, technical, political and sociological details, the romanesque plot makes us dive rapidly into the ambience and décor of the first part of the 16th century in Italy and Europe. To write his historical novel, the Brazilian doctor and professor traveled, by the way, across several European countries and carried out a great deal of research in the files of great libraries of several monasteries as well as in various museums. He read all that had been published at the end of the Middle Ages about syphilis and medicine. However, such abundance of information is perfectly integrated into the narrative, without rendering it either boring or pretentious, owing especially to the balance which creates Fracastoro's beautiful and sad love story. In summary, Memories of a Barber-Surgeon constitutes reading that is both enrapturing and enriching. The book will know how to interest European readers as well as those interested in the history of Medicine, the Science and the religious ideas in Europe. 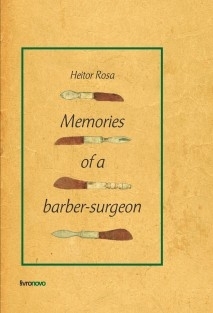 About the authorHeitor Rosa (1940) is a Brazilian writer, doctor and lecturer at the School of Medicine of the Federal University of Goiás, Brazil. During his studies in France and England, he was seduced by the medicine of the Middle Ages and the Renaissance. Having traveled across several regions of France and Italy, he was able to conceive the unfolding of his novels, taking into account the different aspects of life and customs of his characters. The result of these study trips was another novel of historical fiction: Judgment in Notre-Dame (published in English). Rosa has in addition written short stories and chronicles. He believes credibility is the most important element in his fictions.